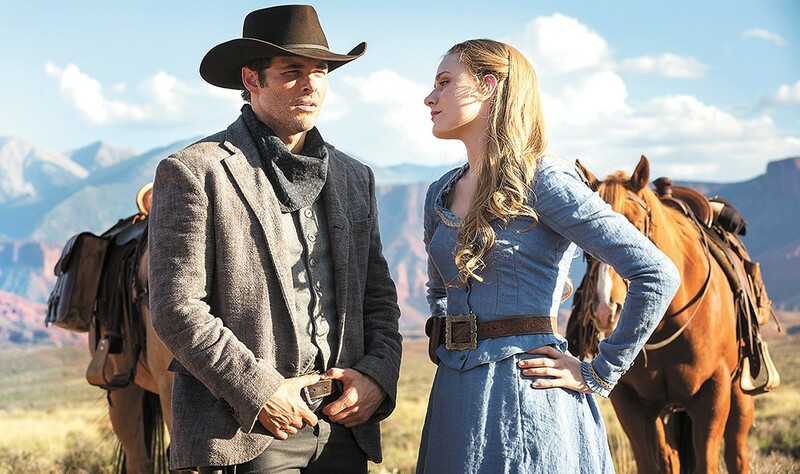 James Marsden (left) and Evan Rachel Wood are just a few of the big names in Westworld. If you've seen the 1973 Michael Crichton movie Westworld — or, more likely, the "Itchy & Scratchy Land" episode of The Simpsons it inspired — the basic premise of the plot of the TV series Westworld (9 pm, Sundays, HBO) won't surprise you: Lifelike robots go haywire in a futuristic Old West-styled theme park, endangering guests. The brilliant evolution of the TV series, however, is that it flips the script: Here, the humans are wearing the black hats, while the robots are the victims of the villainy. Here, we're rooting for the robots to finally take that leap into sentience, and fight back against the torture visited upon them by sadistic tourists. That role reversal continues as Westworld offers twists on other iconic scenes. An abducted, vulnerable woman runs terrified through an alien facility — but here she's a machine. A monstrous killer slowly advances on a hero as the weapons of the victims do nothing — only here, the Terminator is human. On top of that, much of the problems of period drama — the hokiness, the clichés, the anachronisms, the leaden dialogue — become strengths when they're placed in the artificial park of Westworld. The moments of schlock, the show cleverly posits, are put in this world because the writers — not of the TV show, but the writers scripting robotic dialogue within the show — are schlocky. The same goes for HBO's tendency toward titillation and gore. Here, in a way that would feel a bit too cute if it weren't executed so seamlessly, the titillation and gore is an indictment of the immoral park creators, and — in a small way — of the audiences of HBO shows for being so easily amused. Westworld does a fine job of welding the who's-the-robot guessing game of Battlestar Galactica with the terrifying moral specter of minds being erased and personalities rewritten of Joss Whedon's Dollhouse series. Still, there's a missed opportunity for tightly constructed, self-contained episodes, Twilight Zone-type stories complete with a macabre twist. Unfortunately, HBO seems to be relying more on the weaknesses of the modern serial-television structure, complete with arcane clues about a mysterious "game within a game." Any time a show's writers start talking about a "5-year-plan," expect the show to turn into a poorly paced slog down the road. But for now, the show is a thrill ride, succeeding as both highbrow goatee-stroker and dime-novel pulp.